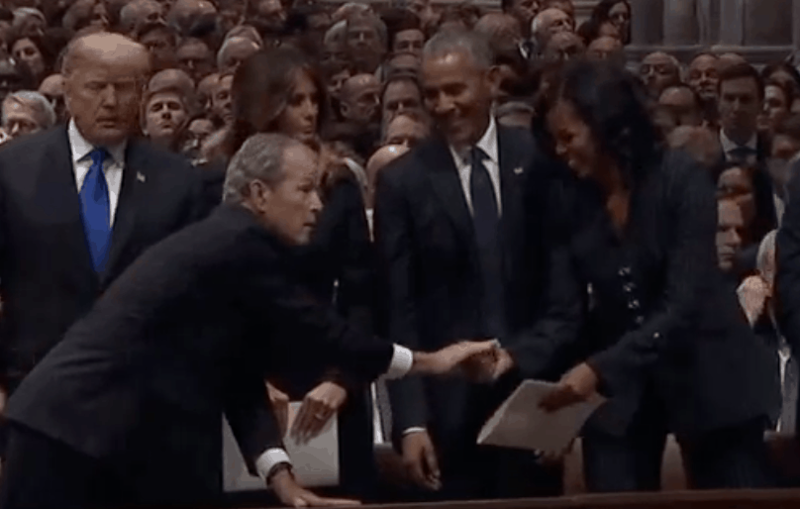 Former President George W. Bush snuck a piece of candy to Michelle Obama during his father’s memorial service Wednesday. The adorable exchange was caught on camera as the former president greeted his predecessors and successors in the front row of the National Cathedral. When Bush reached the former first lady, he reached into his pocket and gave something to Michelle. The sweet exchange echoed a similar moment the pair shared during John McCain’s funeral earlier this year. It seems even George W. Bush can handle a bit of humor during sad moments in his life. The state funeral for George H.W. Bush was held Wednesday and attended by other heads of state, as well as all of the former presidents and their wives. President Trump and Melania Trump were also present. Check out Michelle Obama and George W. Bush’s exchange in the video below.